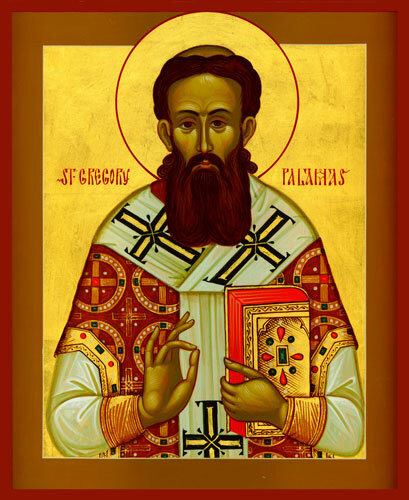 O Gregory the Wonderworker, light of Orthodoxy, support and teacher of the Church, glory of monks and invincible protector of theologians, pride of Thessalonica and preacher of grace, pray without ceasing for the salvation of our souls. O Holy and divine instrument of wisdom, joyful trumpet of theology, with one accord we sing thy praises, O Gregory inspired by God. But since thou standest now in mind and spirit before the Original Mind, guide our minds to Him, O father, that we may cry to thee: Rejoice, O preacher of grace. There will be a Lenten Potluck after the Liturgy of the Presanctified Gifts on every Wednesday night. Welcome, and bring a dish to share if you can. Ss. Mary and Martha Women’s Fellowship will meet on Thursday, 7.00 PM at Helen’s house. Our parish is invited to Missions Vespers tonight (March 31) at Ss. Cyril And Methodius Orthodox Church in Chico, CA. Vespers start at 6.00 PM. We will leave right after the fellowship meal (no later than 1 PM). Archbishop Benjamin will bless us with a visitation April 13-14. Please do your utmost to be there. We want to have a full house! In anticipation of his visit, we will clean the church on Friday, after the Liturgy of the Presanctified gifts. Your help would be appreciated. “For there exist, there really exist, ways which are even more important than abstinence from food which can open the gates which lead to God with boldness. He, therefore, who eats and cannot fast, let him display richer almsgiving, let him pray more, let him have a more intense desire to hear divine words. In this, our somatic illness is not a hindrance. Let him become reconciled with his enemies, let him distance from his soul every resentment. If he wants to accomplish these things, then he has done the true fast, which is what the Lord asks of us more than anything else. It is for this reason that he asks us to abstain from food, in order to place the flesh in subjection to the fulfillment of his commandments, whereby curbing its impetuousness. But if we are not about to offer to ourselves the help rendered by the fast because of bodily illness and at the same time display greater indifference, we will see ourselves in an unusual exaggerated way. For if the fast does not help us when all the aforementioned accomplishments are missing so much is the case when we display greater indifference because we cannot even use the medicine of fasting. Since you have learned these things from us, I pardon you, those who can, fast and you yourselves increase your acuteness and praiseworthy desire as much as possible.